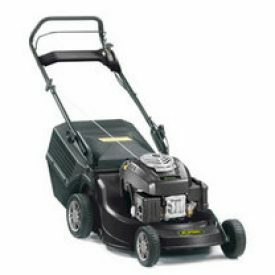 The Alpina PAN504-G lawnmower is designed for medium sized gardens. Powered by Castelgarden engine, this manually propelled lawnmower comes equipped with a sturdy 50cm aluminium deck. It features a single lever height adjustment system which boasts a cutting height range from 20mm to 70mm. The Alpina PAN504-G lawnmower is also a versatile machine. It offers the choice between a collection facility, notable for its 70 litre grassbag capacity, or a rear discharge system which simply allows the grass to fall to the ground when cut. It also contains a deck wash facility, ensuring that keeping the deck clean couldn’t be simpler; just attach a hose to the snap-on connector and the rotating blades disperse the water around the deck. Grass cuttings are blasted into a large collection box - you don't have to stop and empty it so often. Allows the operator to go at their own speed.